(Boulder City) This man attempted to rob the Wells Fargo Bank in Boulder City last week. Anyone who knows this person or has any information about him should contact Boulder City Detective Mark DuBois at 702-293-9224, ext. 1. The unidentified man who attempted to rob the Boulder City branch of Wells Fargo, 412 Nevada Way, on Wednesday, March 27, and Nevada State Bank, 1460 S. Boulder Highway, Henderson, has yet to be apprehended. 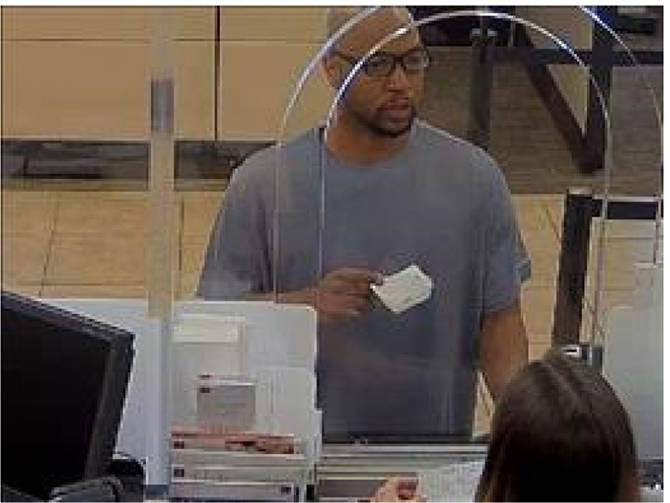 According to the Boulder City Police call log, a bearded black man wearing a gray shirt, shorts and glasses came into the bank around 11:45 a.m. The teller said he had a crumpled $100 bill and asked to get a new one. The teller exchanged the bills, and he then presented a note asking for everything the teller had and no dye packs. Both the teller and the manager said they were confused by the note and asked for it back. He then left on foot and headed north on Avenue B toward Colorado Street. A man matching the same description came to Nevada State Bank on Boulder Highway shortly after, at approximately 12:25 p.m., and attempted to rob it. According to the Henderson Police Department, it was determined the man approached a teller window and produced a note stating it was a robbery. Nobody saw any weapons, and like in Boulder City, the suspect fled the scene before getting any money. There were no injuries at this attempted robbery. Henderson Police said the man was approximately 6 feet tall and weighed approximately 135 pounds. Anyone who has information about this man should contact Detective Mark DuBois at Boulder City Police Department, 702-293-9224, ext. 1. Boulder City is holding four educational sessions about the proposed aquatic center as well as the state of the current pool. The first educational session, “Financing the Project,” will be held at 9:30 a.m. and 4:30 p.m. Thursday, April 11. The second educational session, “Frequently Asked Questions,” will be at 9:30 a.m. and 5 p.m. Monday, April 15. The third, “The Conceptual Design: A Deep Dive,” will be at 9:30 a.m. and 4:30 p.m. Wednesday, April 24. The final session, “Frequently Asked Questions #2,” will be at 9:30 a.m. and 4:30 p.m. Wednesday, May 1. All will be held in City Council chambers at City Hall, 401 California Ave.
City Council approved a ballot question for the June election about whether the city should be authorized to issue up to $40 million of general obligation bonds to build a new aquatic center and replace the city pool, 861 Ave. B. Since that time, the project has been met with criticism and questions from the community. For more information, go to http://www.bcnv.org/pool.